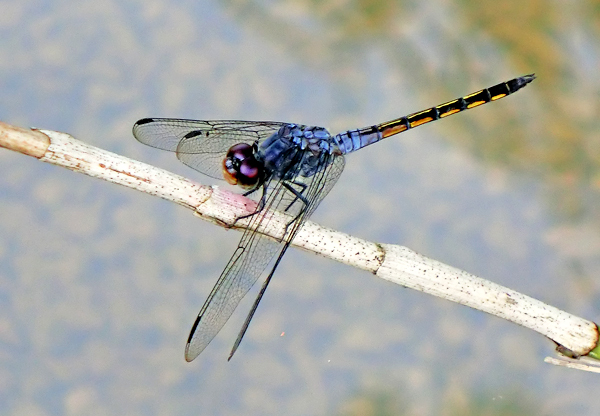 I visited Yishun pond a few times in 2007 and recorded a total of 6 dragonfly species there. You can easily see why the pond was rather lifeless if you look at the Google Earth image (right) captured in 2007. 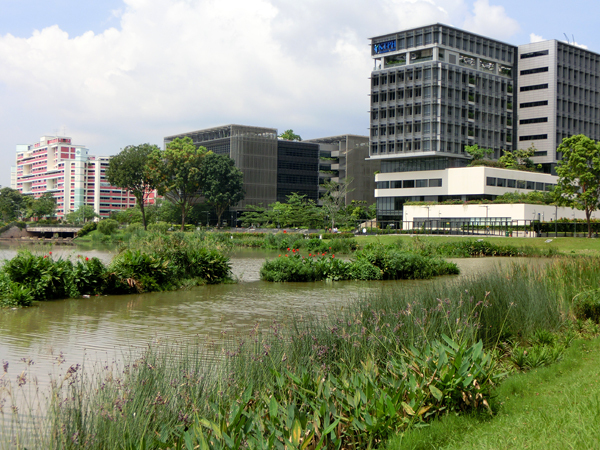 The edge of the pond was just bare grass, which was, of course (in Singapore), frequently and noisily trimmed. Besides, a lot of litter was seen in and around the pond. Last December (2011), I visited the pond again. On the south side of the pond is now a hospital - Khoo Teck Puat Hospital (KTPH), opened in 2010. It can be seen that the designers of the hospital had attempted to integrate Yishun Pond with the hospital's garden courtyard which is situated between the two main hospital blocks. The garden courtyard has two ponds and plenty of plants, which provide shelter and habitats for a variety of creatures - butterflies, dragonflies, damselflies, bees .... These and other green features have made it possible for many of the wards in the hospital to be naturally ventilated, saving a lot on electricity consumption and therefore carbon dioxide emission. Yishun Pond in front of KTPH. One of the small ponds in the garden courtyard. 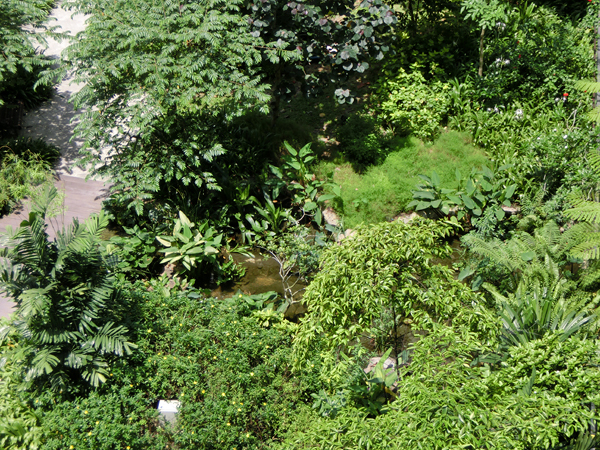 The same pond, seen from above, is almost hidden under the lush vegetation. 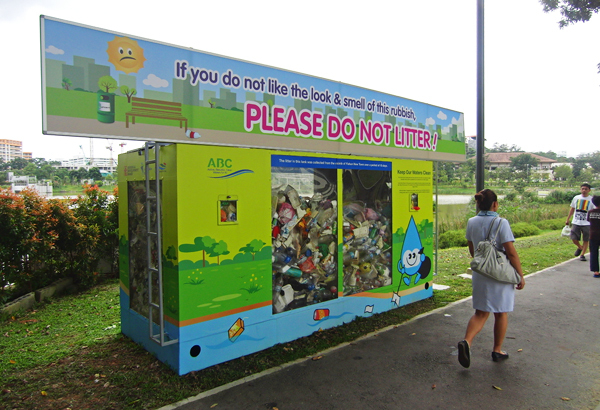 An effort to educate visitors. KTPH does not only heal its patients. 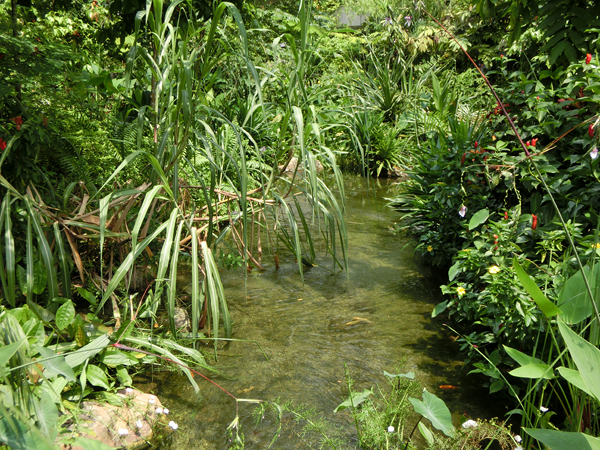 It is also healing the natural environment of Yishan Pond. I visited KTHP two days ago, on 12 May 2012. This is my fourth visit since Dec 2011. I was pleasantly surprised to see, for the first time there, a Banded Skimmer (Pseudothemis jorina) flying along the East edge of Yishun Pond. Banded Skimmer is an uncommon species in Singapore. I was also happy to see Common Chaser (Potamarcha congener) on the North side of the pond. This makes the total number of species recorded in and around KTPH go up to 16 in half a year. 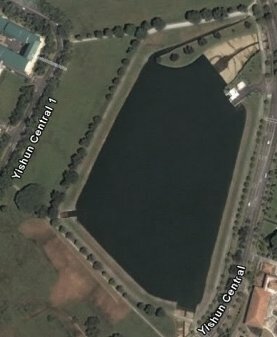 Google Earth has not updated the image of Yishun pond yet. I believe the new Google Earth image of Yishun Pond will look quite different from the one in 2007.